Tests were held at the Saltivske water reservoir in Kharkiv Region. 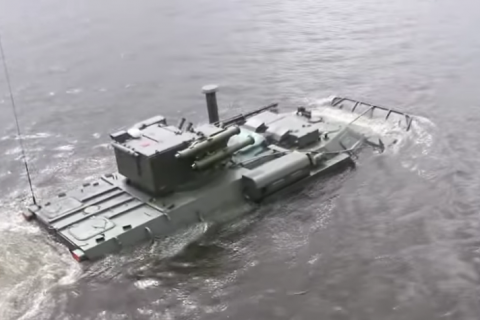 The National Guard has tested the latest Ukrainian Bucephalus BTR-4 APC on water.The video of the test is available from the National Guard's YouTube channel. "For several years now, the Armed Forces of Ukraine and the National Guard have been supplied with the latest BTR-4 APC. It has several modifications with different power units and additional equipment with regard to the planned tasks," the comment to the clip says.The tests were held at the Saltivskyy water reservoir in Kharkiv Region. The Bucephalus BTR-4 was designed by the Morozov design bureau in Kharkiv.On 16 May, the National Guard received the first batch of APCs with German engines. Detectives receive Party of Regions' "second set of books"
Saakashvili denies calling Ukrainian cabinet "mediocre"
Finance minister set to disband tax police "in matter of months"